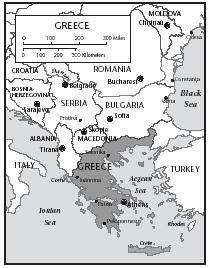 Greece is the southernmost country in the Balkan Peninsula, the region that includes Albania, Macedonia, and Bulgaria to the north. 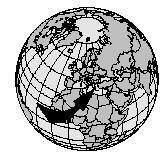 It has a total area of 131,940 square kilometers (50,942 square miles). About a fifth of the area is composed of more than 1,400 islands in the Ionian and Aegean seas. About four-fifths of Greece is mountainous, including most of the islands. Oranges, olives, dates, almonds, pomegranates, figs, grapes, tobacco, cotton, and rice abound in the areas of lower elevation, primarily in the east. Among Greece's main environmental problems are industrial smog and automobile exhaust fumes in the area around the capital, Athens. The smog regularly sends Greeks to the hospital with respiratory and heart complaints. introduced coffee to Greece. Potatoes and tomatoes were brought from New World after exploration of the Americas began about five hundred years ago. 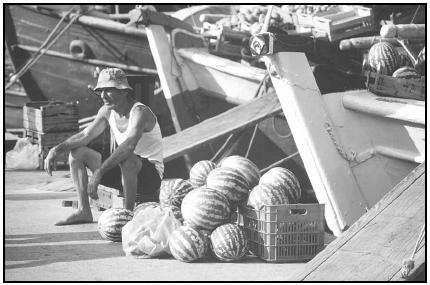 Fresh fruits and vegetables play a large role in the Greek diet. With its long coastline, Greece also relies heavily on fish and seafood. Meat tends to play a less important role. It is often used as an ingredient in vegetable dishes instead of as a main dish. The islands and coastal areas of Greece favor lighter dishes that feature vegetables or seafood. In contrast, the inland regions use more meat and cheese in their cooking. In a large pot, bring broth to a boil over medium to high heat and add salt. Add rice, cover, and simmer on low heat for 20 minutes. Remove from heat. In a mixing bowl, beat eggs well. Add lemon juice to eggs while stirring constantly. Slowly pour 1½ cups of hot chicken broth into egg-lemon mixture, stirring constantly. Add egg mixture to rest of broth-rice mixture. Continue to stir. Heat on low heat without boiling. The Greeks eat bread, grains, potatoes, rice, and pasta nearly every day. Staples of the Greek diet include olives (and olive oil), eggplant, cucumbers, tomatoes, spinach, lentils, and other types of beans, lemons, nuts, honey, yogurt, feta cheese, eggs, fish, chicken, and lamb. The following are some of the most famous Greek dishes: dolmades, (stuffed grape leaves); an egg and lemon soup called avgolemono ; meat, spinach, and cheese pies; moussaka (a meat and eggplant dish); souvlaki (lamb on a skewer); and baklava (nut-and-honey pastry wrapped in layers of thin dough called phyllo ). The national beverage of Greece is strong Turkish coffee, which is served in small cups. Other beverages include ouzo , an alcoholic drink flavored with anise, and a popular wine called retsina. In a large skillet, heat the olive oil and brown the onion, peppers, and garlic. Add the ground meat, paprika, pepper, salt, and cinnamon. When the meat is crumbled and cooked, put it in a bowl and set aside. Sauté the eggplant slices in the skillet, adding more oil if needed. Brown on both sides, remove, and set aside. In a large casserole dish, alternate layers of the eggplant and the meat mixture. Place cover or aluminum foil over the dish. Bake for 45 minutes. In a mixing bowl, beat together the yogurt, egg yolks, and flour. Remove the casserole from the oven and remove cover. Spread the yogurt mixture over the top of the moussaka. Return uncovered casserole to the oven and bake for 15 minutes. Serve hot. Dolmades, one of the best-known of all Greek dishes, are grape leaves rolled around a mixture of ground meat and rice, simmered in a rich tomato broth. Measure olive oil, lemon juice, salt, and pepper into a large, flat dish. Add lamb or beef and stir to coat pieces well. Cover the dish with plastic wrap and let stand in refrigerator for at least 30 minutes. Spear the cubes of meat onto 4 long metal skewers. Preheat broiler or gas grill. Place skewers in a shallow broiling pan. If using broiler, position oven rack about 6 inches from broiler flame. Broil (or grill) meat for 10 minutes, then turn over the skewers and broil 10 minutes more. Remove meat from the skewers with a fork and serve with lemon wedges. Serve with white rice, accompanied by lemon wedges. Greece is a mostly Orthodox Christian country, and many Greeks observe the church's fast days. On these days, they eat either no meat or no food at all. There are strict dietary rules for Lent and Holy Week (the week before Easter). During Holy Week and on Wednesdays and Fridays in Lent, meat, fish, eggs, and dairy products are forbidden. Greeks observe feasts as well as fasts. A roasted, stuffed turkey is eaten for Christmas, and a baby lamb or goat, roasted whole, is served for Easter dinner. A soup called mayeritsa, made with lamb parts is also eaten on Easter. Many traditional cakes are served for both Christmas and Easter. These include honey-dipped biscuits called finikia and shortbread cake-like cookies called kourabiethes . There is also a special New Year's cake called vasilopitta . Before Easter, hard-boiled eggs are painted bright red and then polished with olive oil. On Good Friday (the Friday before Easter) a special holiday bread called lambropsoma is baked. On Easter Sunday, family members crack their eggs against each other for good luck. The diet of people living on the islands and in coastal areas of Greece features abundant quantities of fruits, vegetables, and seafood. Thaw the bread dough according to directions on package, but do not allow to rise. Put thawed loaves on floured work surface. With clean hands, stretch each loaf into a rope about 2 feet long. Hold both dough ropes together at one end and twist them around each other into one thick rope. On greased or nonstick baking sheet, make a circle out of the coiled rope of dough. Brush both ends lightly with water, pinch them together, and tuck them under the coil. Space eggs evenly between coils of dough, tucking them in deep (but still visible) so they will not be pushed out when the dough rises. Cover with the towel and set in a warm place until bread doubles in size (about 1 hour). Brush bread with egg glaze. Bake in oven for about 1 hour, or until golden brown. Remove bread from oven and place on wire rack to cool. To eat, slice or break of chunks of bread. Eggs can be peeled and eaten. To prepare Lambropsoma (Greek Easter Bread) for baking, tuck the four dyed eggs into the twisted coil of unbaked bread dough. In large mixing bowl, mix cottage cheese, cream cheese, and sugar until well blended. Mixing constantly, add honey, eggs, and almond extract. Pour mixture into pie crust and bake in oven for about 45 minutes, until crust is golden brown and pie is firm. Cool to room temperature and serve in small wedges. Beat together butter, sugar, and egg in a large bowl until light and fluffy. Add flour mixture to butter mixture and mix until well blended. Add vanilla and almond extracts and mix well. 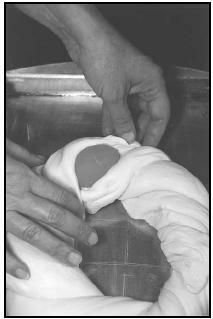 With your hands, form dough into balls, half-moons, or S-shapes. Place cookies 2 inches apart on cookie sheet. Put on middle oven rack and bake 15 to 18 minutes, or until barely brown around the edges. Remove cookies from cookie sheet and cool on wire rack or paper towels for 5 minutes. Sprinkle with powdered sugar. Greeks are not known for eating big breakfasts. Typical breakfast foods include bread, cheese, fresh fruit and, for adults, coffee. In rural areas, the main meal of the day is eaten at around 1:00 or 2:00 in the afternoon. It is followed by a rest period when schools and businesses close, allowing people to stay home during the hottest part of the day. In the cities, however, many people do not have time to go home for a large lunch. Instead they eat a light meal at midday and a larger dinner later on. In the late afternoon, many Greeks help themselves to light refreshments called mezethes . These may consist of bread, fresh vegetables, cheese, olives, dips, or soup. Mezethes are sometimes served as appetizers at the beginning of a big meal. Like many other Europeans, Greeks eat their evening meal late—sometimes as late as 10 P.M. In the city, dinner is the main meal. In rural areas where a big lunch is eaten, dinner is lighter. The most common dessert in Greece is fresh fruit, but the Greeks also love to eat sweets, either as a snack or dessert. Greeks are known for their hospitality. A traditional offering for guests is glyko , a thick jam made with fruit or a vegetable such as tomato or eggplant. It is served with ice water and coffee. Since it is warm and sunny in Greece for so much of the year, eating outdoors is very popular. In a bowl, add the cucumber, garlic, olive oil, and salt to the yogurt. Blend well with a fork and refrigerate. Serve with toasted pieces of pita bread or fresh vegetables, such as carrots, celery, or peppers. Makes 2½ cups of sauce. Combine all ingredients in a large salad bowl and toss well. Cover and toss with Greek salad dressing (see recipe below). Mix all ingredients into a bowl. Pour over salad and serve with warm pita bread. Scrub potatoes under cool running water. Place in a large, heavy saucepan with enough water to cover potatoes completely. Boil potatoes over medium heat 20 to 25 minutes, or until fairly soft but not mushy. Drain in a strainer, cool to room temperature, then peel. Cut potatoes into slices about ¼-inch thick and place them in a 1-quart baking dish. Pour olive oil over potatoes. Add lemon juice, oregano, and salt. Stir very gently to keep potato slices from breaking. Greek potatoes, subtly flavored with lemon and oregano, can accompany grilled or roasted meat—lamb, chicken, or beef. In a mixing bowl, combine yogurt, honey, and lemon rind. Put fruit and almonds in serving bowl. Pour yogurt mixture over fruit and serve in individual dessert bowls. Greece has an abundance of native herbs, including thyme, basil, oregano, rosemary, and sage, and fruits, such as nectarines, oranges, peaches, and apples. Many Greek villagers farm, and herd sheep or goats for a living. Fish (providing protein) and other seafood are plentiful, as four seas surround the peninsula of Greece. Many Greeks have adequate nutrition; however, there is a growing number of homeless children living and working on the streets. Laws to protect children are in place, but applied unevenly. 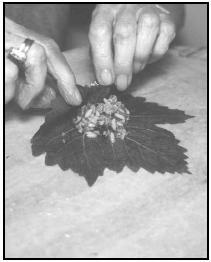 Beatty, Theresa M. Food and Recipes of Greece. Kids in the Kitchen: The Library of Multicultural Cooking . New York: Rosen Publishing Group, 1999. Halvorsen, Francine. Eating Around the World in Your Neighborhood New York: John Wiley & Sons, 1998. Villios, Lynne W. Cooking the Greek Way. Easy Menu Ethnic Cookbooks . Minneapolis: Lerner Publications, 1984. Ellada.com. [Online] Available http://www.ellada.com/grarr15.html/ (accessed March 29, 2001). Greek Food Festival. 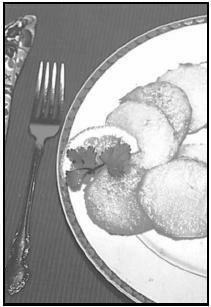 [Online] Available http://ww.greekfoodfest.com/recipes.htm (accessed March 29, 2001).